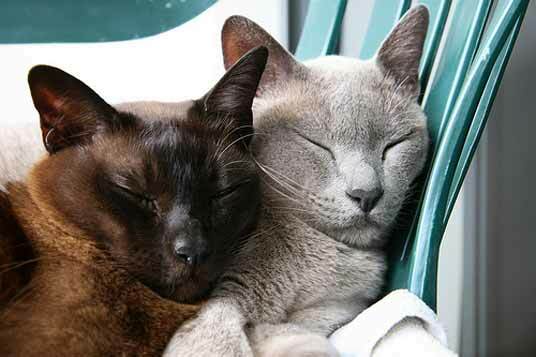 Although there are now two varieties of Burmese cats - American and European - the origins of these can be traced back to a single female. A cat called Wong Mau was brought from Burma to the US in 1930 by Joseph Thompson, an American Navy psychiatrist. 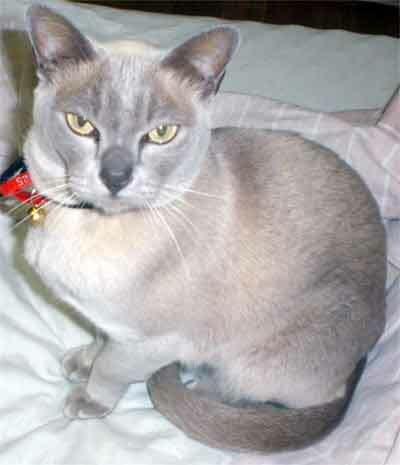 Wong Mau was not a Burmese, but a Tonkinese who was bred with a Siamese cat. Her litter contained kittens with the typical Simases pointed pattern as well as some darker, more lightly-pointed cats. This suggests that the subtle pointing pattern was present in Burma. 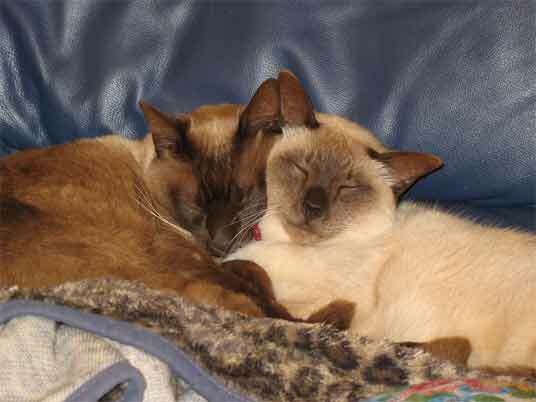 The most lightly pointed kittens were bred and resulted in the Burmese that we know today. Buurmese cats were registered as a breed in the US in the 1930s. American Burmese were exported to Britain after World War II and gained much popularity. In Europe, breeders preferred a more traditional Oriental look, and wanted a wider color range, eventually resulting in blue, red-based colors and tortoiseshells. There are now many color variations, all with the same charming personality. The photograph above was supplied by Cameron Brodie. It features Sullivan and the younger Jasper. 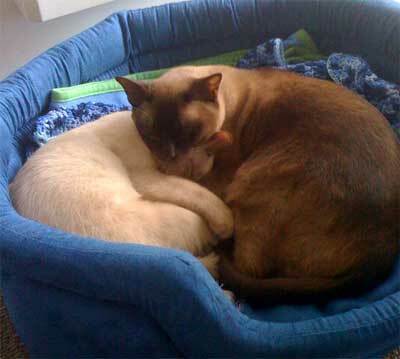 From Britain, cats were exported to Europe, Africa, Australia and New Zealand, and as a result, Burmese cats in these countries are of the European type. On both sides of the Atlantic, they are a consistently popular breed. 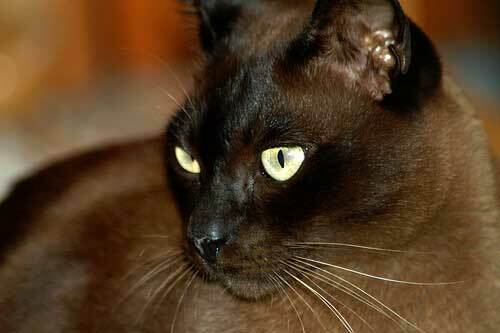 Burmese cats are mainly characterized by the subtle shaded pattern of their fine, short, glossy coats. This shading is called sepia. The shading gradually darkens at the cat's points (nose, ears, feet, tail) and is solid at the roots, with no tabby markings. They have heavy, muscular bodies for their size, but slender legs. They have large, round and expressive eyes, that are only slightly slanted. Eye color is usually gold or yellow. Breeding over time has resulted in the following colors: chocolate (champagne), lilac (platinum), red, tortoiseshell, cream, blue-cream, chocolate tortie and lilac-tortie (lilac-cream). 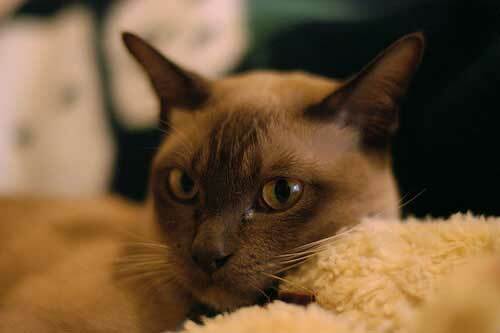 The photo above is our lilac Burmese, Cooga. The major physical difference between European and American varieties is the head. European Burmese have a short wedge-shaped head and a blunt muzzle, whereas the American variety has a shorter nose and rounder skull. The British Burmese has small oval feet, whereas the American Burmese has rounder feet. Burmese kittens have blue eyes at birth and the characteristic golden hues can take months to reach their full color. Visit the Burmese kittens page for photos. Coat colors are always paler in kittens than in adults. 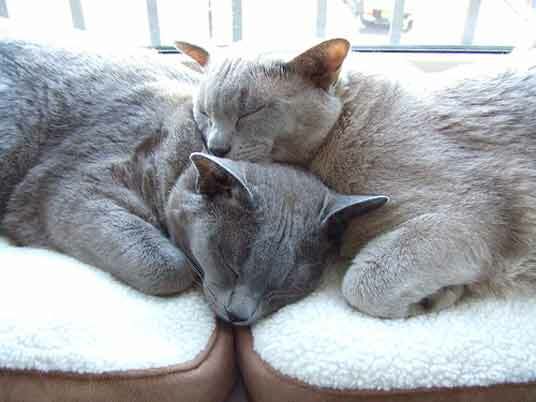 Burmese cats crave company, and have an extraverted, affectionate nature. They are intelligent and very focal vocal, often calling to their owners. They form strong bonds with their owners and gravitate toward human activity. 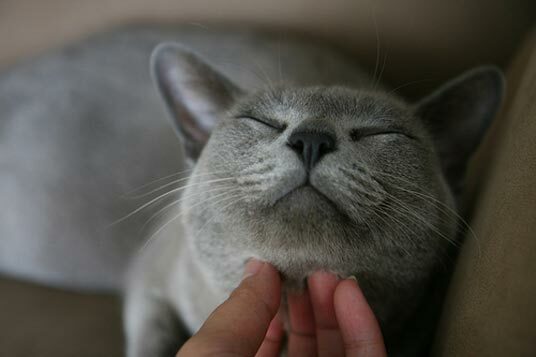 Burmese are often described as dog-like for this reason. They are rarely aggressive with humans, but can certainly defend themselves against other cats. Burmese maintain playful kitten-like behavior and energy throughout their adult years and are very athletic.